The takeaway from advertising’s past? Stop cluttering. “Good reading” this week comes through our coveted 4A’s (American Association of Advertising Agency) membership via their 4A’s SmartBrief, news for the advertising, media and marcom industries. The article appeared on May 23 (so it’s timely) in the British online publication, Campaign, described at their website as “the world’s leading business media brand serving the marketing, advertising and media communities.” Written by a Brit, Charles Vallance, founder and chairman of VCCP Partnership, the global agency that serves such notable clients as Audi, Nationwide, Domino’s and easyJet, the insightful commentary makes clear, pointed and pithy observations. Plus, Vallance makes reference to more “good reading” in one of our favorite books, Al Ries and Jack Trout’s book, 22 Immutable Laws of Marketing. I’ve been reading Campaign for 30 years now and one of the magazine’s most constant refrains has been that the standard of work is deteriorating. Sometimes I feel like I should take personal responsibility. Since I began as a trainee back in 1987, the industry has basically been in decline. Is this merely coincidence? Or is it all my fault (and Charlotte Zamboni’s, given that she started with me as a trainee at the same time)? All things considered, I don’t think I have worked at quite enough agencies for it to be 100% my fault, and Campaign is obviously never wrong. So I’m afraid it all reflects very, very badly on Charlotte. The cynics hardly ever had a good word to say about the here and now. It is possible, therefore, that Campaign’s tendency to think things were better in the past isn’t all Charlotte’s fault. It could just be that it’s a natural part of the human condition. If you open a newspaper or wade through an online news service, it is amazing how much of the advertising within appears jumbled, fragmented and cluttered. For some reason, we tend to look at the past more fondly than we do the present. Perhaps it’s a survival mechanism designed to make us try harder. In which case, it works. Because, contrary to the Fred Trueman-esque “in my day” commentary, I have something controversial to say. It wasn’t better then. Things are definitely better now. We are trying harder and it shows in our output. When I look at a lot of the work we used to idolise, it’s a bit like looking at an episode of Terry and June, It Ain’t Half Hot Mum or Some Mothers Do ’Ave ’Em. You wonder what the big deal was. And this was the good stuff. This was top of the bill on a wet Wednesday. Even George & Mildred went to a fifth series. Of course, there will always be some things that transcend their era. Porridge, some (but not all) of Eric and Ernie, Dad’s Army… erm, I’m already beginning to struggle. Most things date. They date quickly and they date badly. If we’re honest, only a few ads from ten, 20 or 30 years ago still make the grade. 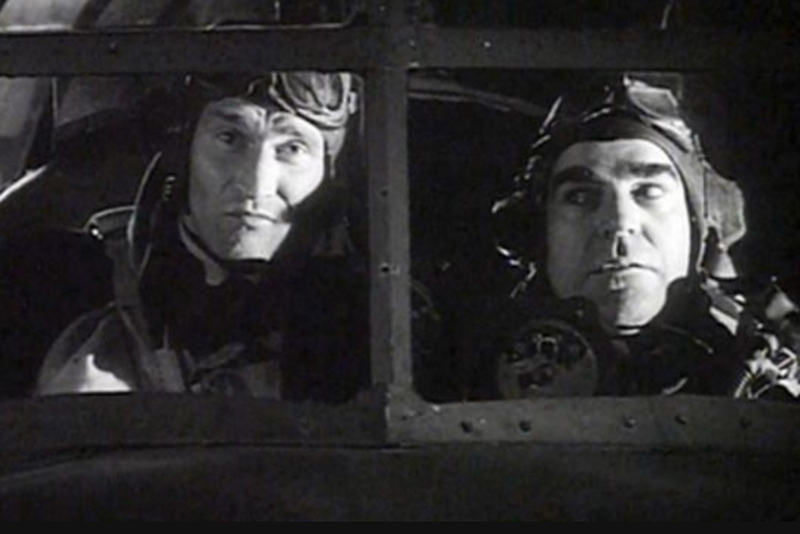 The likes of Smash Martians (pictured above), Levi’s “Launderette” and Carling “Dambusters” (below) are few and far between. Most stuff with a “19” in its birthday would leave a millennial cold. However, one of the things I’ve noticed is that, despite the many changes in cultural pace, fashion, convention and idiom, the fundamental rules of the game remain surprisingly unchanged. The best work still has to earn your attention and it has to do so by having one or more of the following ingredients: originality, entertainment, information, beauty, relevance. But all these are nothing without the most important ingredient of all: a little bit of space. This is where I think a modicum of nostalgia may be permitted. Things used to be rather less cluttered, rather less crowded, rather less busy. Not just in the world of advertising but in the world of everything. Now, supermarket shelves are more crowded, roads are more crowded, diaries are more crowded, phone screens are more crowded, minds are more crowded. No wonder we love brands that simplify and streamline, brands that edit and curate. I have said before that the amount of information we have to consume each day has turned us into cognitive misers. We are ruthless editors, intolerant of interruption, complexity or waffle. Yet if you open a newspaper or wade through an online news service, it is amazing how much of the advertising within appears jumbled, fragmented and cluttered. There are exceptions, of course, but many advertisers seem to work on the basis that “we won’t have their attention for long, so let’s cram as much as possible in while we do”. This, of course, is a fantastically self-defeating logic. The 13th rule of Al Ries and Jack Trout’s 22 Immutable Laws of Marketing is the law of sacrifice, which dictates that you have to give something up to get something back. We don’t apply this law often enough. We are not sacrificial enough. We are often too consensual, too quick to submit to the blandifying effects of multi-stakeholder decision-making. The problem can be exponential because, before you know it, you don’t just have overloaded messaging across multiple channels for multiple stakeholders, you also have different microsites sprouting up for different business divisions, different workarounds for different legacy systems and a vigorous undergrowth of sub-brands all competing for budget. Because we’re in the thick of it, we sometimes don’t see how this tangle of communication is beginning to obscure everything else. But it is never too late to chuck out the communication chintz, declutter the brand cupboard and jettison the marketing bric-a-brac. A good spring clean will not only make us feel better, it will create some space around the brands we work for. So there’s some room left over to fit the customer in. Charles Vallance is the founder and chairman of VCCP. Rarely do you hear someone who can confirm the important truths that you’ve spent a career learning. It takes someone who has been to the mountaintop to validate what you’ve believed to be true all along. For all of us at The Un-Conference: Brand Leadership in an Age of Disruption that someone was Rob Siltanen, the creative director and copywriter behind one of the most iconic ad campaigns in history. Siltanen’s presentation was entitled “Building a Disruptive Campaign” and was based on his work from nearly 20 years ago for the then struggling Apple computer brand and the campaign he directed called “Think Different.” If you’ve read the accounts or have seen the movies since Steve Jobs’ death, chances are you are more likely to hear Lee Clow’s name mentioned (Rob’s former boss at Chiat/Day), but no matter – they both pitched the business. You may have even believed that Jobs created the campaign (an urban legend … he originally hated it before later embracing it). But as happens so often, there’s more to the story. But this is not so much a re-telling of Siltanan’s account of the campaign as much as it is a distillation of some of the wisdom that is wrapped around creating it. There is much that we can learn or can have affirmed as fellow marketers with this recollection, no matter what we are marketing or for whom. Naturally, the genesis and execution of “Think Different” provides significant weight and drama, given the reverence for Steve Jobs, the Apple brand, and the admiration of the agency Chiat/Day. It really was a high stakes encounter when Clow and Siltanen sat down with Jobs after his return to Apple in 1997. But then again, all of us face similar situations that have the same relative importance in our own careers and for our own clients. That’s the value to us of hearing the experience from the one who was there. The following highlights of Siltanen’s “Think Different” experience will help all marketers build a disruptive campaign. The Idea Is Everything. “Think Different” was the quintessential disruptively big idea. However, in the years since, the reverence for “the idea” has waned with other advertisers and marketers. The advancement of technology with digital media capabilities and such has tended to crowd out the search for the big idea in favor of the newest media fad. As Siltanen reminds us, it’s the idea that pulls the media wagon, not the other way around. It Can Be Smart To Tell Clients That They Are Wrong. As Siltanen relays the story, the agency was in a very strong position at the time and wanted nothing to do with getting caught up in a pitch war for the Apple brand relaunch. Emboldened by this position, Rob had no reservations in setting Jobs straight on the fallacy of giving tactical direction. And it worked. Jobs was intrigued and Chiat/Day seized the initiative by ultimately producing one of the top launch campaigns in history. Had Siltanen not spoken up and not stayed the course the creative would have been just another computer campaign … if produced at all. The lesson here is that you have no hope of winning if you don’t fight for the work. Or as Siltanen observed, if campaigns don’t work and produce results, everyone loses their jobs anyway. So you might as well improve the odds of success with a great idea. Who could argue with that logic? Great Ideas Can Emerge From Brief But Essential Information. If you’re looking for an exhaustive creative brief and reams of research in the “Think Different” case study, don’t bother, because it evidently didn’t exist. The client gave the agency very little to go on but the essentials were familiar to the agency, such as the correct assessment of the marketplace situation, the campaign objective to launch a new product line, etc. In this case, that’s all that was needed to get the job done. But this raises the question: How often do we as marketers fail to agree upon even the most essential information in formulating a strategy? Many campaigns actually fail in the planning stages long before they are ever launched, simply because there is no clarity or consensus regarding even the most fundamental direction. Advertising Still Has An Important Role To Play. Granted, the world has changed over the last 20 years. And that’s especially true in marketing. The role and value of advertising has been the subject of debate among brand marketers, in part because it has been handled so ineffectively (see the previous “the idea is everything” paragraph). In 1997, Facebook was not yet born. Cell phones hadn’t become “smart.” There was no YouTube (as Rob lamented to run a 2+ minute length “Here’s to the crazy ones” video version). And even radio was still holding its own as an advertising medium. Nowadays there are many more media options to reach an ever-increasingly fragmented audience than there were then. Yet, real disruption can still be effectively waged when advertising is used well. “The Medium Is Not The Message. The Message Is The Message” according to Siltanen. This is in reference to Marshall McLuhan’s idea first introduced in 1964 that the medium “embeds” itself in the message and becomes part of it, thus “the medium is the message” philosophy. In many respects, this is true – the way we receive information says a lot about the information itself. But this mindset can put “the medium” in the driver’s seat, making “the message” a mere passenger in terms of marketing communication importance. Siltanen argues conversely that the “message is the message” and should be uninfluenced by media choice. And in the hands of the marketing strategist, one can choose the appropriate and most effective delivery vehicle for the message. Therefore, as marketers, we must resist the temptation to think of the latest media fad like a magic bullet. The Message is first. The Medium is second. Get the message right. The medium is not the message. The message is the message. Understand the power of visuals. Sell the idea through the system. Understand the strengths and weaknesses of every medium you work with and how different media interact with others. No single medium has all the answers. Are we willing to be disruptive marketers ourselves? Are we willing to not settle for anything less than the big idea? Are we willing to challenge ourselves and our clients, and fight for our ideas by selling them all the way through the system? Twenty years after his work with Apple, Rob Siltanen heads his own Los Angeles based ad agency Siltanen and Partners. Some remarkable data emerged from the World Federation of Advertisers last week after they surveyed 50 of the world’s top marketers who, with a combined marketing spend represent a potential $82bn of global ad spend. Two-thirds of these marketers expect to move more of their marketing money into digital next year. Many, by as much as 40%. Although 75% aren’t convinced of digital marketing’s effectiveness, 68% will invest more next year. Marketers continue to switch more and more of their budgets to digital marketing, away from so-called traditional channels. They do that not because traditional media is losing share or engagement or because digital media metrics actually make sense or impress anyone. They do it, quite simply, because it is in their nature to favor the new over the old. The digital over the traditional. This article helps explain why. Many years ago, in a different century, I worked for a smart, very experienced global marketing director. He hired me to train some of his new marketers and over a period of a few years a friendship grew. For an inexperienced, naïve young marketing professor my association with a high-profile marketer at such a famous brand was something of a coup. I soaked up his advice every time we met and hung off his every word. At one of our meetings he informed me that his newly arrived CEO had just given him notice that he was no longer needed at the company and he was about to be replaced. Half drunk and stung by the news, I railed for several long minutes about the injustice of pushing out such a proven, talented marketer. When I had exhausted the rant my senior friend rested his hand on my arm with a wry smile and asked: “Have I ever told you the story of the Scorpion and the Frog?” I shook my head and, after pausing to order another two Negronis, he told me a tale that I still, to this day, remember. It’s a simple but powerful parable that can be used in innumerable situations to explain the apparently inexplicable and satisfy even the most troubling empirical conundrum. And that’s why I tell it to you now. A scorpion is scurrying across the parched desert floor when he hears the unmistakable and entirely remarkable sound of a droplet of rain landing on the dry sand bed next to him. A few seconds later another one lands. Then another. And another. Before the scorpion knows it, a torrential rain storm is upon him and very quickly the arid desert is transformed into a fast-rising river bed. Alarmed and acutely conscious of his inability to swim the scorpion heads for a small area of elevated ground. He reaches it but is surrounded, and with the water almost reaching his legs, the scorpion prepares for the end. Suddenly, over in the distance, he spies movement. As the blurry image comes closer he recognizes a frog swimming across the newly formed river with very apparent glee. “Hey!” shouts the scorpion. “Swim over here and let me get on your back. I need a lift over to the higher land over there”. The frog pauses. The scorpion is her mortal enemy and she fears the arched sting that he carries in his tail. But she approaches and looks, not without sympathy, at the apparently doomed arachnid. “If I come any closer you will sting me,” she says. “Nonsense,” the scorpion replies. “If I get on your back and then sting you I will die as surely as you in the water”. The frog ponders the situation for a moment and then, cautiously, swims over and allows the scorpion to climb on to her back. The two unlikely partners turn and swim towards the higher land off in the distance. A few yards before they reach higher land the scorpion pulls back his tail and strikes deep into the frog’s neck. Stunned the frog looks up at her passenger and, as the poison starts to paralyze her system, she has just enough time to utter a single word: “Why?”. As the paralyzed frog and her passenger sink to their deaths beneath the water the scorpion shrugs his shoulders and says: “It’s just in my nature”. When my marketing mentor got to this punchline he paused, drained his glass and gave me another sad smile. His point was that his talent, experience and track record were all meaningless in the face of a new CEO who was always going to clean house and bring in his own new team. Some things in business, some things in life, are simply unavoidable, irrespective of the situation or the data at hand. I learned that story a quarter of a century ago. These days I am the old weary marketing professor using it to explain the way of the world to bright-eyed young MBA students. I tell it to you now because it’s the best and simplest way to explain the extraordinary data that emerged from the World Federation of Advertisers (WFA) last week. The WFA surveyed 50 of the world’s top marketers who, in terms of combined marketing spend, represent a potential $82bn of global ad spend. Despite the fact that 45% of all marketers can’t see the value of digital advertising, 75% aren’t convinced of its effectiveness and 72% think marketers have over invested in digital, a massive two-thirds of that same sample expect to move more of their marketing money in to digital next year – many by as much as much as 40%. The majority will spend more on digital advertising next year. Yeah I know. 75% aren’t convinced of its effectiveness yet 66% will invest more next year. Pause, consider this data, and gulp. The legendary marketing professor Christine Moorman has been publishing the same finding for many years in her annual Duke University CMO Survey of senior marketers. Her pie chart of marketers invariably shows around two-thirds unable to show the business return on digital marketing and unconvinced of its ultimate value. But her next pie chart shows a similar proportion of marketers determined to invest more in digital marketing channels in the year ahead. These empirical results are as illogical as they are consistent. Most marketers will continue to switch more and more of their budget to digital marketing and away from so-called traditional channels. They will do that not because traditional media is losing share or engagement or because digital media metrics actually make sense or impress anyone. They will do it, quite simply, because it is in their nature to favor the new over the old. The digital over the traditional. And the Scorpion and the Frog and everyone else on board will taste water, a surfeit of it, before this decade is over as a result.